During the Saints’ 2001 negotiations with the state of Louisiana, rumors circulated that Benson would seek relocation if his requests which included renovations to the Superdome, a new practice facility in suburban Metairie, and escalating annual payments from the state to the team could not be met. Though he never made public statements to this effect, Benson’s business ties to the city — and the availability of the Alamodome as a playing facility — made San Antonio the most common subject of speculation. 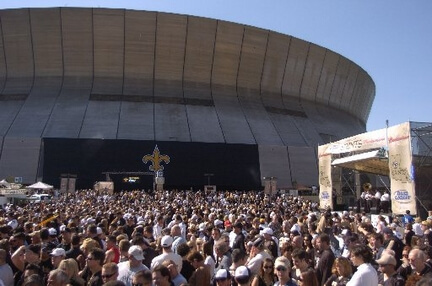 When it became clear that Hurricane Katrina’s extensive damage to New Orleans and the Superdome would make it impossible for the Saints to play there in 2005, the team temporarily relocated its operations to San Antonio and began negotiations to play home games at the Alamodome. (The Saints, after discussions with the NFL and Louisiana State University, eventually agreed to play one “home” game at Giants Stadium against the Giants, three games at the Alamodome and four games at LSU’s Tiger Stadium in Baton Rouge).